The Italian brand Aspesi is well known for producing immaculately made, basics and stunning casualwear with a distinctly luxe edge. The label incorporates contemporary design into classic shapes and some of the most luxurious fabrics to produce tailored separates that are timeless and chic. The range of suits from the brand provides some fantastic examples of this ethos, with skinny and close-cut styles sitting alongside more voluminous, modern looks. 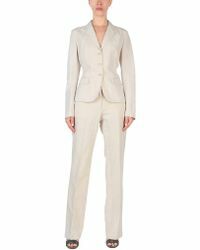 The brand produces both skirt and pant suits in a variety of colours, from muted blacks, creams and browns through to, classy whites, sleek greys, sophisticated metallics and eye catching purples.